Last fall Finovate added an Accelerator Showcase where pre-seed startups from fintech accelerators pitch on stage for three minutes. That’s where I first heard George Cook, founder of Honeycomb Credit, one of two startups selected to pitch at FinovateSpring by accelerator AlphaLab. The Pittsburgh-based company got its start as a class project at Dartmouth’s graduate school of business. But co-founder Cook and his classmate Ken Martin received so much positive feedback from the idea they decided to make it a real company in 2017. The company is joining what was expected to be a crowded space of SMB crowdfunding. But the lengthy implementation of the U.S. crowdfunding framework has caused many of the 38 startups in the space to give up leaving room for new companies such as Honeycomb. The notable exception is Funding Circle which has raised $375M (note 1). Other active platforms include Finovate alums P2Binvestor (raised $9.2 million) and SeedInvest (raised $8.2 million) along with Crowdfunder (raised $6M), Fundable (acquired by Startups.co) and Wefunder (raised $2.3 million). Indiegogo (raised $56 million) is also now involved in equity crowdfunding, although it is currently a small piece of its overall rewards-based funding platform. Honeycomb is a debt crowdfunder where investors loan money at bank-like rates to SMBs currently unqualified for bank funding. In addition, like Kickstarter or Indiegogo, non-monetary gifts and experiences are offered to incent action on the part of would-be-lenders. 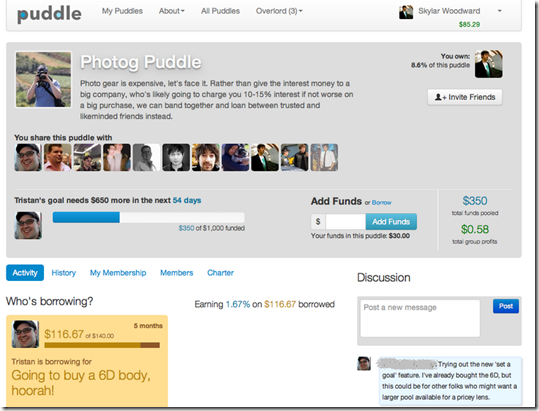 For example, Pittsburgh Pickle offered t-shirts to the first 20 investors in its $10,000 to $50,000 crowdfunding campaign (see screenshot at top). It also invited anyone who kicked in at least $1,000 to an exclusive event at the pickling facility. The idea is to enable small businesses to tap their local community for debt capital on better terms than higher-rate alt-lenders such as Kabbage or OnDeck. According to Cook, its SMB customers are “near bank quality” but lack one or two of the typical prerequisites such as 3 years of tax returns. But at least one of their beta customers used Honeycomb not because they couldn’t get bank financing, but because they’d been burned in the past and preferred a non-bank alternative. The loans are funded by individual investors on the platform, using the same model as Lending Club, Prosper, or Zopa. Thanks to the provisions of the crowdfunding act (specifically Reg CF), investors need not be accredited, an important aspect of the Honeycomb business model, which relies on the borrower’s friends, family and customers to fund the loan. Eventually as the business scales, HoneyComb expects to attract institutional and high net worth funds seeking yields from alternative assets. Honeycomb’s special sauce is community and collateralization. It lends to existing businesses looking to expand expand their share of wallet within their predefined market. For example, it recently ran a successful campaign for an ice cream shop to buy a truck for mobile sales. And whenever possible, HoneyComb takes equipment as collateral on the loans. Borrowers typically pay platform lenders 8% to 12% interest on 3- to 5-year installment loans. At the conclusion of a successful money-raising campaign, Honeycomb charges borrowers an 8% fee and investors 2.85%. Honeycomb doesn’t hold loans on its balance sheet, so all credit risk is pushed to investor/lenders. The startup has begun rolling out the platform having ran two successful campaigns, raising $50,000 for an ice cream truck and $25,000 for several new greenhouses. There are currently two more in process, one of which has already surpassing its minimum raise amount. To expand, Honeycomb is currently raising a seed round. They have received good publicity in their local market, but to make that scale to other markets Honeycomb may need to find local partners such as local development groups, governments, and financial institutions. However, Honeycomb believes that the public nature of crowdfunding campaigns will drive a large number of new customers to its platform keeping customer acquisition rates low. To reach profitability Honeycomb needs to expand beyond its Western Pennsylvania home market. That’s going to be a challenge without compromising quality. The company hopes to attract revenue from ancillary services and balance sheet lending down the road, but that’s much easier said than done in the fickle SMB sector. As with many businesses, it’s all about scale and efficiency. Honeycomb will need to automate its processes while simultaneously increasing loan size. But as loan sizes increase, they will begin to run up against a raft of competitors, including banks and credit unions. But I also think there is a good opportunity to license the Honeycomb platform to banks and credit unions wanting to add crowdfunding to their SMB services. Author: Jim Bruene (@netbanker) is Founder & Advisor at Finovate as well as Principal of BUX Certified, a financial services user-experience standard. 1. Also in the UK there are 4 other platforms with good traction: Crowdcube (£21.2M raised for itself) Seedrs (£13.7M raised), SyndicateRoom (£8.7M raised) and Venturefounders (£6.8M raised). 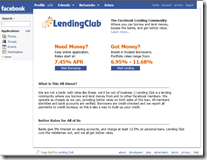 The company launched as one of the original Facebook desktop apps in May 2007 and made its industry debut at the first Finovate in September 2007. Its December 2014 IPO briefly valued the company at $9 billion, the largest-ever IPO for a fintech startup. The company was the second person-to-person lender in the world (after the U.K.’s Zopa) and the first in the United States, launching in Feb. 2006. It also made its industry debut at the first Finovate in 2007. It was much larger than Lending Club during its first few years; however, high default rates from its pure auction model scared away early investors. But the company retooled its underwriting and has become the third largest consumer P2P marketplace in the USA (and the world outside China). Small and mid-sized businesses (SMB) were hit hard in the 2008 recession with lower profits combined with a massive dry spell in traditional bank credit. So, naturally, entrepreneurs moved in and picked up the slack. On Deck was one of the first on the scene, making its Finovate debut in 2009. Originally, On Deck was dipping its toes into the direct lending space as a proof of concept for its small-business lending platform it hoped to sell to banks. But it turns out they were in the right place at the right time, and, after a December IPO, On Deck is a successful public lender valued at $1.5 billion. With $700 million in loans originated in Q1 2015, Sofi just passed Prosper to become #2 in the United States—and in the world, outside of China. The company initially focused on refinancing student loans for graduates of elite universities, but it has diversified into other types of consumer and SMB lending. 5. Avant: $1+ billion. Forbes recently estimated its value at $875 million; we think that’s low based on the $1.4 billion, including $350 million in equity, that startup has raised. Like On Deck, Avant is targeting a segment abandoned by traditional lenders in the aftermath of the 2008 financial crisis. But Avant’s specialty is sub-prime borrowers, a segment with higher margins in good times, but risky bets in downturns. The only non-U.S. company on the list is London’s Funding Circle (although Wonga is probably still close, and has been above $1 billion in the past). Funding Circle, which specializes in SMB marketplace lending, was founded in 2010 and moved into the U.S. market last year with the acquisition of Endurance Lending. Also in the running: Finovate alums Kabbage—meet them at FinovateSpring next month, along with a handful of other promising newcomers; CAN Capital; Kreditech; and Wonga, which was valued well above $1 billion in 2012, but has had a falling out with U.K. regulators. Several peer-to-peer lenders in China are believed to have obtained unicorn status, the biggest being Lufax, which was said to be valued at almost $10 billion by the Wall Street Journal last week. One thing that always struck me as odd about the financial services startups of the late ’90s and early 2000s was their obsession with deposits. I can understand the appeal of having people send you money; it’s a rock-solid, low-risk part of the banking business model. But it also contains massively entrenched players who already have the consumers’ trust, along with a vast branch network to back it up. And it’s a commodity. The much bigger opportunity for newcomers, to my thinking, is to go after the loan side. Consumer trust is almost a non-issue since you are handing them the money. And loan underwriting is both an art and a science with thousands of variables to innovate on. But it’s a dicey area for investors. The economic downturn of 2000-2002 spooked the VCs as dotcom-darling NextCard went belly up (as did other non-online, sub-prime lenders). Then the big hit in 2007/2008 killed whatever business plans had been drawn up in the post-2002 period. And there will always be concerns about where to find more funds to lend out, especially in the post-securitization world. Fast-forward seven years. 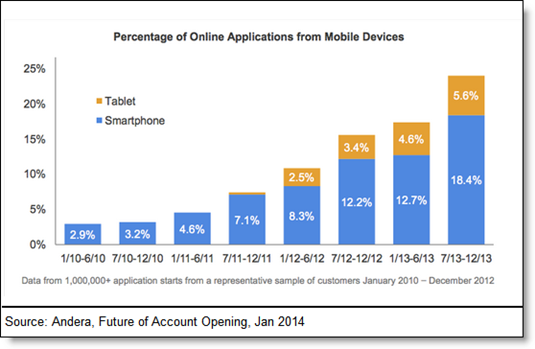 We are finally seeing an explosion of consumer and small business lending online (with mobile coming on). This newfound activity is being led by the so-called crowdfunders and P2P lenders tapping institutional money along with accredited investors (and VCs) to deliver capital using a mix of debt and equity terms. Another specialty lending area exploding online is secondary educational financing (note 1). For example, Sofi started by targeting graduates of elite U.S. universities. 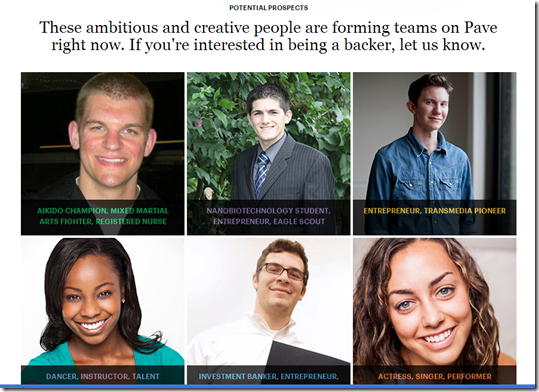 CommonBond is focusing on graduate students. ProdigyFinance lends to international MBA students. 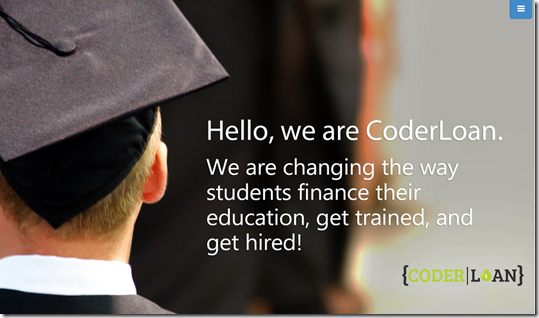 The latest entrant in the educational space is CoderLoan (screenshot below). The NYC-based startup is working with employers and educational institutions to help finance participants in coding bootcamps, where tuition can run $10,000 for a summer-long program. Employer sponsors can repay the CoderLoan after a set amount of time on the job. Or the graduates themselves can afford to repay the loans with their developer-level salaries. Bottom line: The uptick in digital specialty lending is win-win-win. There are potentially good returns for investors (note 2) while more capital flows to both entrepreneurs looking to expand and employees wanting to sharpen skills. Ultimately, that leads to a more productive and engaged workforce and a more rigorous economy. 1. For a 38-minute discussion on crowdfunding student lending, check out the panel at the Lendit conference in San Francisco three weeks ago (link). The panel included Vince Passione, LendKey; Mike Cagney of SoFi; David Klein of Commonbond; Cameron Stevens of Prodigy Finance; and Brendon McQueen of Tuition.io. 2. Most of the activity is too recent to fully understand whether the risk is being priced adequately (see NextCard in 2002), but the results from the earliest entrants — Zopa, Prosper and Lending Club — are promising. 3. 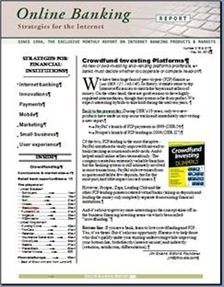 For much more on crowdfunding (debt and equity), see our May 2013 report (subscription). When we first started Finovate in 2007/2008, during the depths of the financial-services sector collapse, there were maybe a half-dozen major venture fintech fundings per quarter. In comparison, yesterday (25 March 2014), in a single day, 10 fintech fundings were announced totaling nearly $60 million (according to Crunchbase). Yes, you read it right. TEN in 24 HOURS! And that doesn’t even include ThreatMetrix, whose latest $20 mil round didn’t make it into the database by today’s noon (Eastern Time) cutoff. What are the drivers? As you can see from the list below, the digital currency craze attracted nearly half the amount, with $23.5 million sent to three companies. Crowdfunding and other alt-lending has been absorbing large amounts of capital of late, and yesterday pulled in another $20 million in three fundings. The other four ran the gamut from $12 mil into a prepaid card company and $1+ million each in insurance, healthcare payments and stock analysis. Is it 1999 again? That’s not for me to say. I hope not (obviously). But it’s hard to believe that there is enough revenue to sustain even a small portion of these startups. Clearly investors believe there are major disruptions ahead in all things financial. It’s not so much the amount of the funding, though that’s one of the biggest C-rounds we’ve seen in the space, rivaling Square’s $100 million round in June 2011. But the jaw-dropping aspect was the valuation, a reported $1.75 billion, double what PayPal just paid for Braintree, which is far bigger than Stripe. But as PandoDaily’s Carmel DeAmicis and Michael Carney point out, it was favorable terms (2x liquidation-preference) that substantially boosted the valuation. Regardless of the funny VC math involved, it was a monster round for the small company. 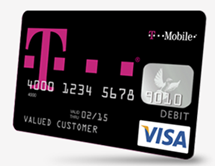 An interesting play by T-Mobile – turning their 7,500 locations into cash-handling mini-branches – is its new Mobile Money prepaid card. I’m not sure that’s the business I would have entered if I were in charge, but it will be closely watched. If it’s wildly profitable (unlikely), it could put pressure on the entire U.S. branch banking system. More likely, its success will be moderate and will fizzle out in a few years when T-Mobile finds more lucrative ways to deploy its real estate and sales staff. Andera, the online account-opening powerhouse, this week published a useful report (free with registration) analyzing account-opening metrics across its 500 clients. The stat that caught my eye was the number of mobile applications already being received, despite the newness of the channel for financial transactions. One in four Andera-processed financial product applications are received from tablets or smartphones, up from one in 25 three years ago. And three-quarters of the mobile volume is from smartphones. I am a big fan of crowdfunding and expect massive growth (note 1), but I never thought I’d see it used by a fintech company to fund a new feature. But Balanced Payments, a Y Combinator-backed payment-startup serving online marketplaces, successfully raised more than $50,000 last week in about a day (Crowdhoster campaign). 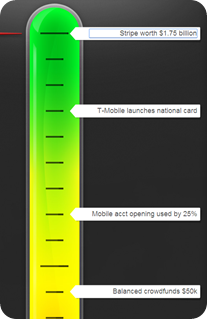 That surpassed its goal for adding a “push to debit card” (Techcrunch post). It sounds too good to be true. 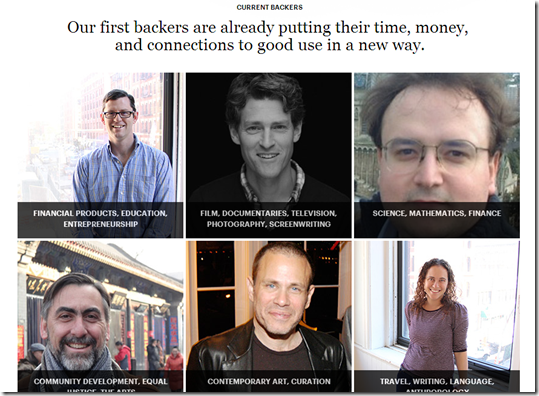 But the startup used a clever incentive system for backers: prepaid fees. In other words, Balance customers could pledge a few thousand dollars for the feature, and then that money paid upfront would cover a given amount of transaction fees in the future. And the more that was pledged, the cheaper the transaction fees became. And there was a large incentive to pledge at the $10,000 level (see below). You could also toss in $25 for a T-shirt. So far, there are 26 backers (25 if you don’t count my T-shirt pledge). Note: For much more on crowdfunding (debt and equity), see our May 2013 report (subscription). We believe crowdfunding has the potential to materially impact banking market share in the next 20 years. Tapping the massive capital and higher risk tolerances of institutional and individual investors, these platforms will provide funding to segments currently underserved by traditional lenders (e.g., small and micro businesses). We’ve written extensively about the consumer debt-based crowdfunding, which we’ve called P2P, or peer-to-peer, lending (note 1). Now, we turn to the new crop of startups arranging funding for small businesses and startups. Finally, we look at specific opportunities for retail banks to leverage the new technology. 1. We have published three reports in this area (OBR 127 in 2006, 148/149 in 2007, and SR-5 in 2009). In addition, we’ve created a 10-year forecast for U.S. P2P lending in each of our last six year-end reports. 2. We do not cover the donation or rewards models, such as Kickstarter. While those are effective ways for businesses to raise money and/or visibility for new products, they have fewer parallels and opportunities for retail banks. If you’ve ever worked in lending (or for a nonprofit), you know there’s always far more need than funds that are available. That is unlikely to change at a macro level. But that doesn’t mean we can’t reach tens of millions more by deploying capital more widely and more efficiently (and at a profit). 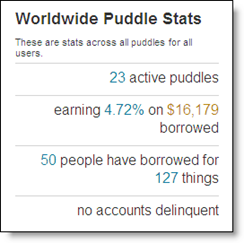 Enter crowdfunding, and the subset, P2P lending. I’ve been a huge fan since it burst on the scene in 2006, authoring several reports (note 1) along with the only open letter in my life when the SEC squelched P2P in 2008/2009. I just could not believe that something with so much potential for good was curtailed while in its infancy. But luckily, the tide is turning. Even though last year’s Jobs Act is being held up (by guess who again), I’m encouraged that our government is seeing the light, although I wish Washington would embrace P2P like the Brits have. And despite onerous disclosure requirements, Lending Club is on fire (with a $1.4 billion run rate in Feb) and proving to investors, and industry observers, that crowdfunding works. For the sake of the nascent industry, let’s hope it doesn’t stumble. We are working on a new report on the space (note 1), but in advance of that, take a look at Pave (see below), one of hundreds of newcomers. Maybe I’m a just a sucker for the drama, but it absolutely gives me chills to see web-based investment/lending platforms helping to move deserving folk forward. It’s like a virtual credit union. 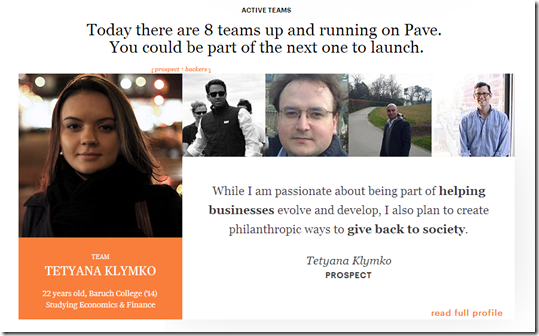 At Pave, backers pledge money to prospects and form a team. In return, backers receive a portion of the prospects’ future income. It’s like angel investing, but focused on careers. 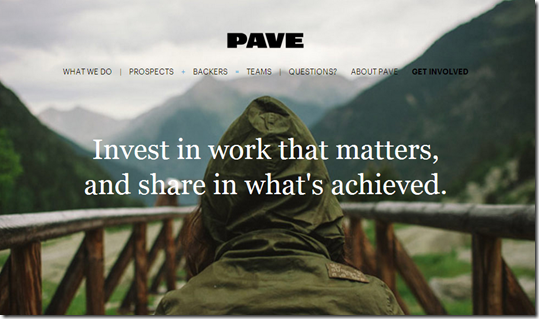 Pave is just getting started, with eight funded teams, but the stories are compelling and the future is bright, just as it is for the whole industry. 1. We have published three reports in this area (OBR 127 in 2006, 148/149 in 2007, and SR-5 in 2009). We are working on our fourth. It will focus more on equity and debt crowdfunding for small and mid-sized businesses. Our latest P2P lending market forecast is contained in the current Online Banking Report here (Jan 2013, subscription). While I’ve read TechCrunch since its beginning, I’ve only been able to make it to their semi-annual event, Disrupt, once before. It’s usually just too close to our own Finovate. But this year I made the trek to Pier 94 in Manhattan to see what was going on in tech in general and to meet with the fintech startups in the Startup Alley or Battlefield launch competition. There were six fintech companies in total. Three offered variations on card-linked offers, one has developed an alternative payment system, one was a newer payments gateway, and surprisingly there was just a single crowdfunding platform. Startup Battlefield competitors from fintech: TechCrunch selected thirty companies in advance. All have agreed to launch their companies on stage at the event. 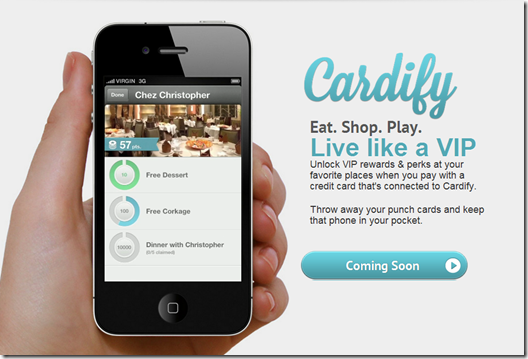 Cardify: Card-linked loyalty/offers geared toward local merchants. Sean Rad is CEO and of the West Hollywood company which has raised $750,000. Mirth: Same as above. Jeremy Philip Galen is Founder. The NYC-based company is bootstrapped. Startup Alley participants from fintech: These are companies less than two years old that qualify for a table in the networking hall. Each day one of the Alley companies is voted to the stage to compete in the Battlefield. Observations: It was interesting to see three new card-linked rewards companies all going after the local market. But if you look at what Groupon’s done with local merchants and where Square is headed, you can see there are huge opportunities here. And the payment APIs available from Cardspring (which both Mirth and Cardify use) are making it relatively easy for startups to tap into a merchant’s card transaction streams to make offers, tally rewards, identify frequent customers, and communicate with them. As a side note, Cardify has a gorgeous UI. It’s very hip and high-end looking like something you’d see at more well-funded companies such as Square, Simple or Mint (screenshot below). Kudos to the design folk there. 1. While not a fintech company, as an auction junkie, I was intrigued by Outbid’s social mobile/online auction platform. The company said it’s talking to four banks looking to host live auctions on their site to use for promotions and social gaming. I think it’s a promising idea, one I’ve explored a few times over the years. But with Facebook Connect you can actually get a critical mass of customers involved very quickly. The company had the cheesiest demo I’ve ever seen (and that’s saying something), but that shouldn’t impact your decision. If you dream of being Mark Cuban, Mr. Wonderful, or one of other Shark Tank investors (note 1), a wave of new angel-investing platforms are springing up all over the world. TechStars, a NY-based incubator, said it had more than 30 applications from crowdfunding startups for its summer 2012 class. In the United States, the recently enacted JOBS Act has spurred interest since it is expected to expand the market to several million more investors. But more importantly, the new legislation will lift the ridiculous “quiet period” rules that are supposed to keep companies from openly soliciting investors (note 2). Once companies can openly look for investors (expected by early summer), private-placement investment platforms have a lot more to offer to companies seeking capital, namely a marketing opportunity. Think about it. If you need $500,000 to launch a new line of organic granola bars sold nationwide, would it be better to get it from a couple local angels, or from 100 investor-fans kicking in $5,000 each? The latter approach gives you 100 evangelists in all corners of the country. And with only $5,000 invested, each investor has far less ability to meddle in your affairs. In the past, the paperwork involved in booking $5k investments made it prohibitively expensive, even if you could find the investors under the old quiet period rules. But the new investment platforms promise to standardize the paperwork, reporting, and sales of small blocks of company shares. So, who are the leaders in the space? AngelList certainly, but it focuses on tech only. Of the newcomers, CircleUp which is launching this week, seems to have the most traction, at least measured by press mentions. Co-founder Ryan Caldbeck has recently been featured in the WSJ, NY Times, TechCrunch and the other tech blogs (note 4). I’ve been using the beta version for a week, and am impressed. Circleup is focused on consumer products, and three companies are currently featured within the site, raising $100,000 to $500,000 each. I’m itching to drop the minimum investment ($3,333) into one of them just for fun. However, my wife wonders if that will be the same “fun” we had the last time I thought I could pick stocks (note 5). So, I’m still just an observer for now, but a very interested one. 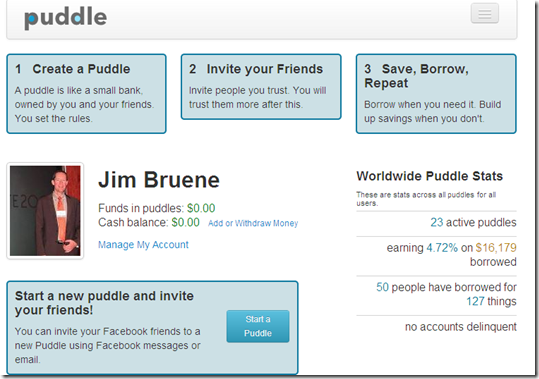 Circleup is a lot like a simplified version of P2P lending. Companies seeking capital post their investor deck, introductory video, and any other info they deem important to their story. An online forum allows investors to ask questions that the companies can answer publicly (though this was little used during private beta). 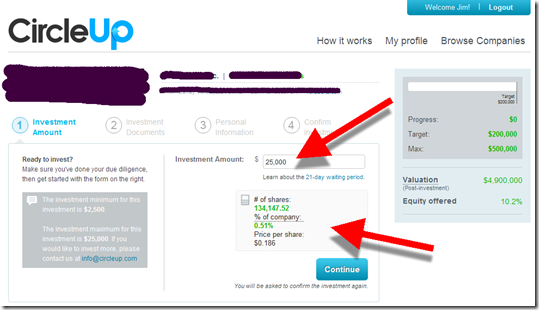 Investing is as simple as clicking on a button, agreeing to the terms, and pledging the funds. Once the minimum investment round is reached, the money is taken from investor bank accounts. If it’s allowed to flourish without being crushed by the SEC when the inevitable scams appear, crowdfunding could eventually provide stiff competition in small business lending. Probably not in its current form, where the investments are speculative, ill-liquid equity bets. But fast-forward a few years and imagine a marriage of crowdfunding with P2P lending, and with the liquidity issue fixed through secondary markets. Small- and mid-sized businesses could use a crowdfunding platform as one safe source to get a mix of equity, debt, and receivables financing. Banks should also consider getting involved in crowdfunding by partnering with the platforms to provide debt and other banking services to the small business participants. 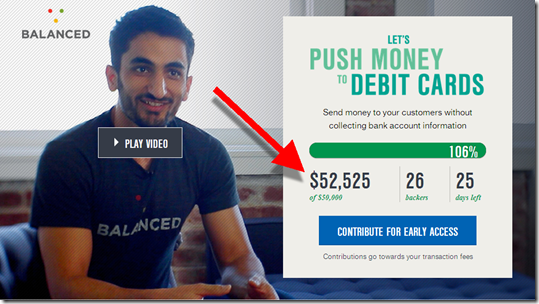 Banks could even start, or at least invest in, crowdfunding initiatives of their own. 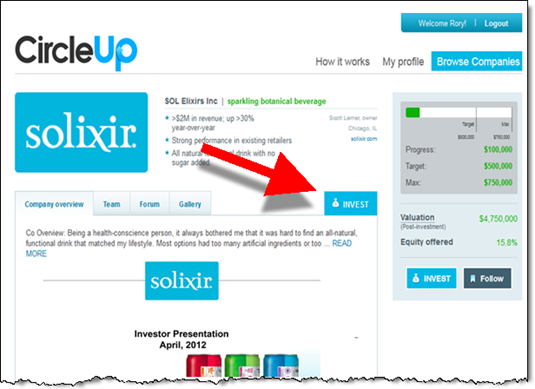 Note: Fictitious listing; note investment button in middle-right. Note: For $25,000 (the max allowed), I get 134,000 shares, or 0.51% of the company. Actual company seeking capital through Circleup, name masked due to the soon-to-be-ending prohibitions against soliciting investors. 1. 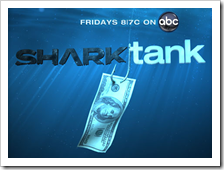 Shark Tank is the U.S. version of Dragon Den. It’s my favorite show on television, though I don’t like how founders are sometimes ridiculed by the celebrity investors, whose egos struggle to fit on the same soundstage. 2. Though Shark Tank, watched by millions on prime-time network TV, demonstrates it’s not a well-enforced rule. 3. Ryan Caldbeck’s 10-minute discussion of the JOBS Act is worth watching if you want a quick overview of its impact. TechCrunch covers the launch 18 April 2012 here. 4. Our policy at The Finovate Group is to NOT invest in fintech companies. 5. For more ideas on innovating in the small-biz banking market, see lengthy report on the subject, written 2 years ago.